Now I’m going to be up front with this, I have no interest in Digimon. I remember it being on television when I was younger and it basically just seeming like it wanted in on the Pokemon phenomena. I don’t actively hate it either though so it won’t change my opinion on Digimon All-Star Rumble. Saying that, it’s not great. 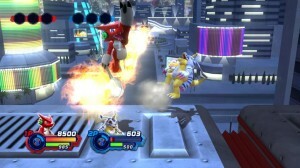 Digimon All-Star Rumble is a fighting game staring Digimon from across multiple series of the cartoon of the same name. Not a fighting game like Street Fighter or Tekken, or even Smash Bros. The closest point of comparison is probably Power Stone. 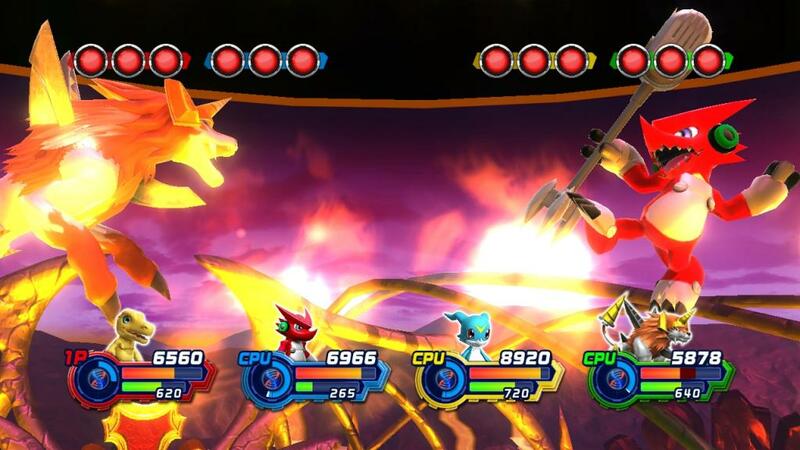 You can run around 3D arenas picking up power ups in the hope of gaining an advantage and you can turn into a more powerful form (Digivolve) once you’ve filled a meter. 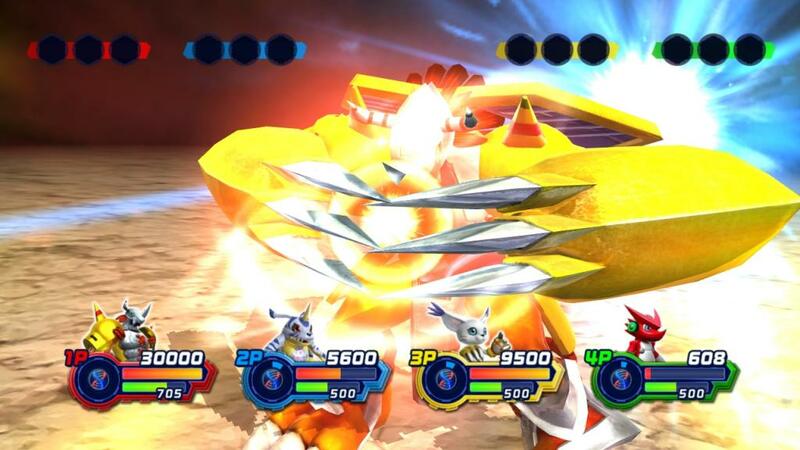 You fill said meter by performing combos or getting hit, Digivolving then makes you faster, more powerful and you cannot be stunned, but only for a short time before you revert to your default state. There are twelve characters to choose from, though only three are available from the off and the rest have to be unlocked by playing the single player. Each character has a light attack, heavy attack, ranged attack, guard and a jump as well as charged variants. You can string together attacks for some basic combos and by tapping L1 when you’re getting beaten on you can teleport behind your opponent but at the cost of some meter. You can also attach attack and defence cards to your character for extra bonuses but these too have to be unlocked through the single player. Speaking of which, no matter what character you pick the single player experience is the same. The dialogue (conveyed through text, no voice acting) is different depending on the character and the order you fight people in changes but other than that it’s exactly the same. It is a peaceful time in the Digimon universe and as such the Digimon arrange a friendly tournament to see who’s the strongest though not all is as it seems. You play through short adventure stages where you fight some cannon fodder enemies, collect power ups, cards or money (to buy cards) and do some basic platforming before reaching your next true opponent. Do this eight times and you’re finished. Not too unusual for a fighting game you might say. There is one other mode in the game, a battle mode where up to four players can fight it out in six different game styles: Point Battle (damage opponents to gain points), Survival Battle (limited lives, last one standing wins), Medal Battle (damaging your opponent makes medals fly out but anyone can collect them, first to three wins), Damage Race (most damage dealt wins), Flag Battle (you gain points for holding onto a flag, damage your opponents to make them drop the flag) and Bomb Battle (everyone has a bomb on their back, doing damage shortens the bomb’s fuse). You can have bots take the place of humans if you can’t get enough players locally but unfortunately there is no online whatsoever. And that’s it. You get two modes, no online and the fighting itself isn’t particularly deep or rewarding. There is the collection aspect of the cards but they didn’t seem to make a whole lot of difference to make getting a super rare one worthwhile and there isn’t enough game to make going for them interesting. So who is this for? 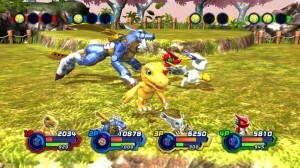 Well, I’m sure die hard Digimon fans might get a kick out of playing as their favourite characters especially if they’ve got three equally interested friends to play with locally. Other than that I don’t think there’s enough here to hold many peoples attention. There is a trophy for playing for fifty hours and I think that’s going to be a struggle, even for trophy hunters. You get two modes, no online and the fighting itself isn't particularly deep or rewarding. So who is this for? 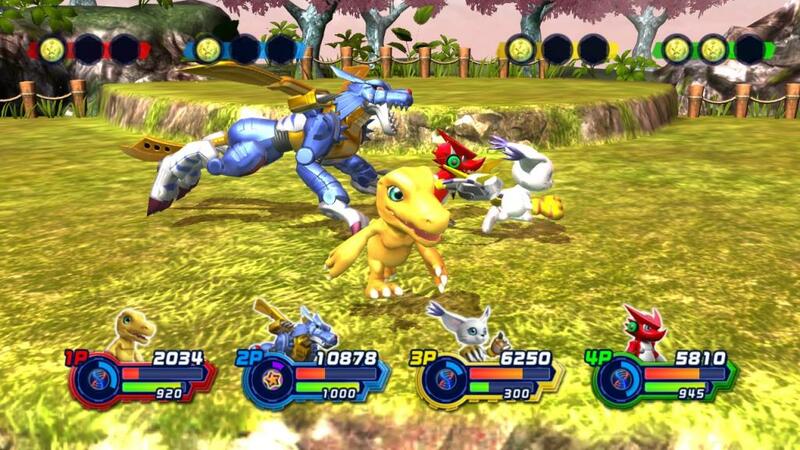 Well, I'm sure die hard Digimon fans might get a kick out of playing as their favourite characters especially if they've got three equally interested friends to play with locally. Other than that I don't think there's enough here to hold many peoples attention.